•Shell Eco-Marathon is an annual event held by Shell, which encourages students from all over Pakistan to develop future technologies that represent fuel efficiency and game changing innovation techniques. •Pakistan started participating in the Shell Eco-Marathon in the year 2009 at the event held at Berlin. •Pakistan was the first South Asian country to participate in the Shell Eco-Marathon. •11 teams will have the privilege to represent Pakistan in the Shell Eco-Marathon this year. •The highest rank received by a Pakistani team is 4th in the Prototype category. 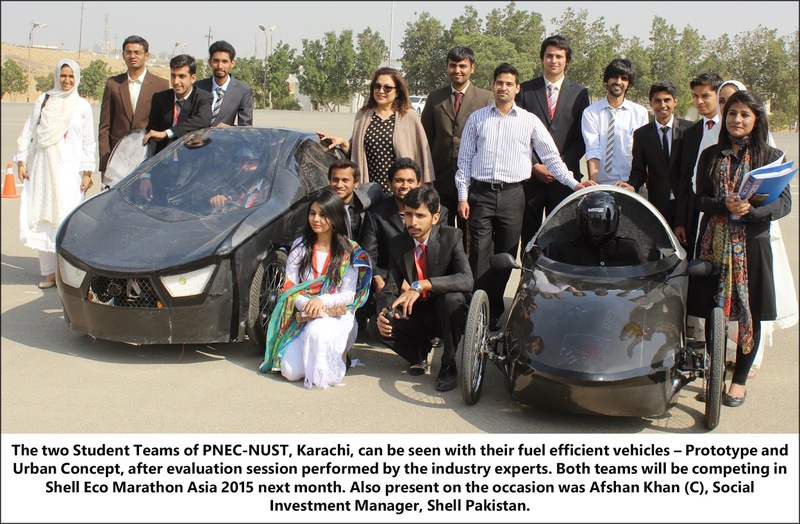 •The universities participating in the Shell Eco-Marathon Asia15 is Pakistan Navy Engineering College (PNEC-NUST), COMSATS Institute of IT, NFC Institute of Engineering and Fertilizer Research, Ghulam Ishaq Khan Institute of Engineering Sciences and Technology (GIKI), Wah Engineering College, National University of Sciences & Technology (NUST), Pakistan Institute of Engineering and Applied Sciences (PIEAS) and Air University. •The teams will be judged on predefined categories that include Building around Health, Safety, Security & Environment (HSSE), Reducing Ecological Footprint, Out-of-the-Box Design, Bringing Innovation to Life and Future of Energy. •In order to improve the quality of projects representing Pakistan, Shell Pakistan is conducting a road-show to evaluate each fuel efficient vehicle developed by Pakistani students. •During the evaluation sessions, vehicles of student teams will be rigorously tested before they embark on their journey to the Philippines, to give them a better chance to win one of five exciting prizes. •The Shell Eco Marathon is a global initiative taken by Shell to reduce greenhouse gas emissions caused by transportations. •Automobiles alone make up 13% of the total greenhouse gas emissions. •The competition enters Asia for the sixth year, marking the 30th anniversary of the Global Shell Eco Marathon. •158 student teams from 19 countries of Asia and Middle East will hit the track in Manila this year. •The Shell Eco Marathon is being held at Luneta Park in Manila, Philippines this year. •This is the second time the Shell Eco Marathon is being held in Manila, Philippines. •The circuit track in Manila requires extremely agile ‘Driver Skill’ to maneuver the vehicle across the 4 tight bends of the track. •The two categories through which teams can participate in the event are Prototype and UrbanConcept categories. •The Winners and Runners Up will receive prize money of $2000 and $1000 respectively in both the categories. •Six Off-Track Awards will also be given out to deserving teams. •The categories for off-Track awards are Communications, Vehicle Design, Technical Innovation, Safety, Perseverance and Spirit of the Event and Shell Helix Tribology Award.